Made with luscious pears and vanilla, this jam is created by slowly simmering the ingredients in a copper cauldron, until they are cooked to perfection. 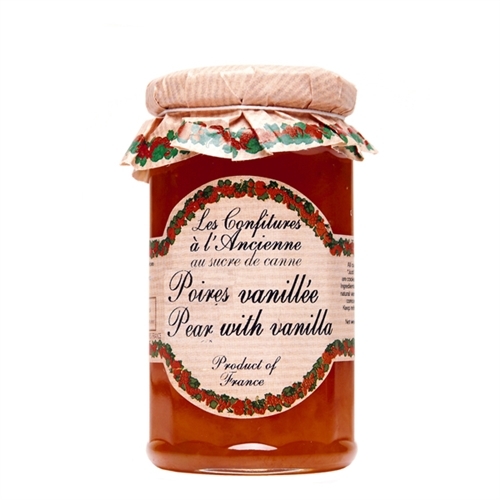 The pear and vanilla flavors meld together to create a jam that is suited for many occasions. Let this take you back to French farm breakfasts: third of a warm baguette with a soft cheese and an our pear and vanilla preserve spread on top . Ingredients: Cane Sugar, Pears, Concentrated Lemon Juice, Fruits Pectin, Natural Vanilla extract. May contain traces of Nuts and Milk.